Three men who are about to be first-time box office movie stars stopped by downtown San Diego to speak with NBC 7 Friday. Spencer Stone, Alek Skarlatos and Anthony Sadler stopped an armed terrorist aboard a train to Paris in 2015. 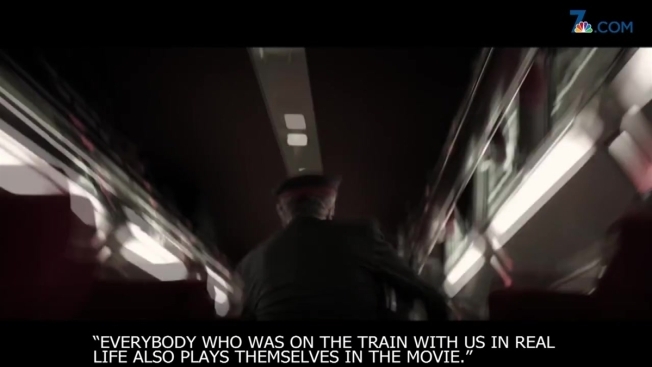 In The 15:17 to Paris, the film about their heroic act, the three friends were asked to act in it, reenacting their own lives, by director Clint Eastwood. The unprecedented move by the Hollywood giant took the three lifelong best friends by surprise. "It was just a complete shock," said Stone. "Because this kind of thing never happens." The movie was originally going to use three established actors to play the parts of Stone, Skarlatos and Sadler. About a month into casting, Eastwood made it clear to the men that he had a different plan. "And we just said, 'Mr. Eastwood, are you asking us to play ourselves in the movie?' and he said, 'yeah, why not?'" recalled Stone. "And it just went from there we just couldn't say no." The Sacramento-area men were vacationing in Europe when they tackled Ayoub El-Khazzani, a man who authorities said has ties to radical Islam. El-Khazzani had boarded the Paris-bound train with a Kalashnikov rifle, pistol and box cutter. The three humble heroes added at first they were nervous to act out their first few scenes in front of Eastwood. But he made them feel comfortable and confident by reminding them that they were just with their friends. They also discovered some things that surprised them about filming a movie. "The attention to detail was shocking," said Sadler. "There was somebody's job just to make sure the luggage was sitting correctly in the scene. Hundreds of people come together to make this film. It was a trip because it was our life story and we're playing ourselves, so we got to see the attention to detail they were putting into our lives." A book was also released about the incident. The actors said the movie is actually more accurate than the book. "The movie is a combination of all our of stories," said Skarlatos. "So we kind of hammered out everything that actually happened. Our actual body positions and the order that things happened in as well as witness statements." Will the US Run Out of Avocados If the Border Closes? All three men agree they have now caught the 'acting bug' and want to pursue the career full time. The 15:17 to Paris comes out in theaters Friday, February 9.